Recently, I ranted about winter driving and getting stuck in a ditch. That rant shortly made it's way to Jalopnik where some people read it. Some people suggested buying snow tires as an alternative to the (questionable?) idea of trading my Dodge Charger in for a Pontiac Solstice and buying a four-wheel drive beater to get through snow days and thunderstorms. Other folks suggested buying a Saab. Both ideas are excellent alternatives and they are still on the table, but I thought I would drive a Solstice anyway for shits and giggles. Yeah, that was a mistake. I want one now. 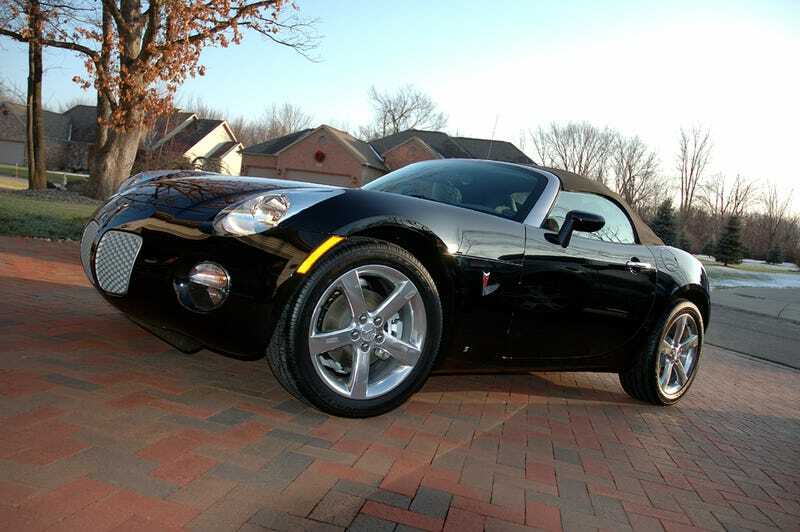 Why would I choose a Pontiac Solstice over it's arguably superior rival, the Mazda Miata? That's a good question. Seriously. As we all know, the Solstice is poorly packaged — for example, standard sized luggage will not fit in the trunk with the top down. Visibility is rather poor in any direction that isn't forward with the top up, which makes traveling in reverse or passing other motorists a guessing game based on how tightly you've clinched your buttocks together. It's also a two-seat junkyard on wheels. The rear axle, storage bin, and (if you were stupid enough to buy one) the automatic transmission are all borrowed from Cadillac. The backup lights are from a crusty old GMC Envoy and the fog lamps are from the last-ever Pontiac Grand Prix. The interior vents are borrowed from the Fiat Barchetta. The standard 2.4 liter Ecotec four-banger is from Chevrolet's dollar store PT Cruiser knock-off, and the five-speed manual gearbox is from a Chevrolet pickup truck. Somehow, the Solstice manages to be more than the sum of its parts after subtracting it's negatives. It looks better than the Miata, I think, with the lines suggesting something akin to the old Jaguar E-Type from certain angles. It handles brilliantly and, despite being borrowed from Papaw Bill's old farm truck, the manual gearbox isn't afraid of speaking directly with you. It isn't a fast car by any means, but it feels fast even within the confines of the speed limit. The exhaust note of the 2.4L Ecotec is even nice and it doesn't complain about moving the car around. Even more surprising, perhaps, is that the insurance premiums ring up cheaper than what they currently are for the Charger. Hmmm ... We'll see what happens.